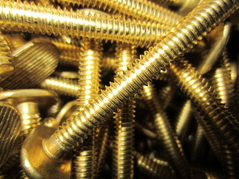 Keystone is the leading manufacturer of brass and bronze fastening products. Keystone services a wide variety of Industries, including the automotive, electrical products, and the plumbing goods industry, to name just a few. With the capability to produce machine screws from a #4 diameter through 1/2 inch, in lengths up to 4", Keystone can satisfy a wide range of requirements. Custom finishes can also be applied, some of which include chrome, nickel, brass plating, zinc, and tin. In addition, Keystone can provide product in bags or other custom packaging, as well as bar coding on labels as required. As the largest buyer of brass cold heading wire in North America, Keystone is positioned to supply other screw and rivet manufacturers with brass and silicon bronze to fulfill their need to manufacture their products.